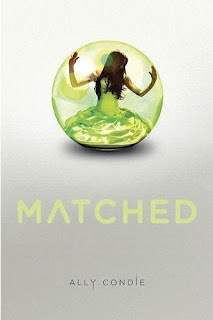 Today is the release day of Ally Condie's stunning first novel, Matched ! Read it, seriously! Cassia's entire world is ordered and precise: everyone is guided and instructed by the Society so that they may live a perfect, happy, and healthy life, and no one has ever questioned the Society's ways. But Cassia's life is changed forever when, after her Matching ceremony, she sees Ky Markham's face on a screen as her match, instead of Xander’s—her true match. The Society tells her this is just a rare computer malfunction, and Cassia knows she should be happy--Xander is her best friend, and there isn't anyone else she would want to be Matched with. But things are changing, and now Cassia isn't so certain about her life. She is intrigued by Ky and his past, and by the events that formed the Society. But her curiosity will come at a price, and as Cassia learns more, she will be forced to make a decision that could cost her everything she values. Matched is a spectacular debut. Condie's world is detailed and comprehensive, leaving little of mundane tasks and processes for the reader to wonder about, though Condie keeps you on edge by building little mysteries into many elements of the story and asking many small, yet probing questions. (For example, what is the purpose of the third pill everyone is required to carry at all times? How far does the Society stretch?) Readers who are fans of dystopian novels may even recognize tidbits of The Giver , Brave New World , and Fahrenheit 451 in Matched, but despite that, Condie's novel is truly in a league of its own. Cassia is a perfect narrator: she's smart, curious, and observant, and she can think things through, but most importantly, she’s just a normal teenager. The evolution of her thinking, from trust and complacency in the Society, to determination in discovering truth and answers, is the most remarkable and entertaining aspect of the novel. Before he dies, Cassia's grandfather imparts a basic and powerful lesson to her: it is all right to wonder, the main propulsion of the plot. And Cassia does just that, through many strange occurrences and tiny bits of forbidden poetry she discovers, until she is able to see the Society for what it is and, for the first time in her life, form her own opinions and decisions. Blurring definitive lines between right and wrong and good and bad, Matched is an unparalleled and spellbinding read that is as beautiful and enthralling as it is powerful and galvanizing. Cover Comments: I love how symbolic this cover is: Cassia really is trapped within her own bubble of ignorance and complacency, though as the story progresses, she does test the boundaries and try to escape. The colors and the otherwise simplistic nature of the cover are a good choice, and make for a very striking package! Thanks for the great review! I just recently received this one, I'm definitely going to have to give it a read! Terrific review! I just finished this last week and really enjoyed it. You summed up the book so well and brought up important points. I can't wait to read the next one in the series! I really do want to read this book, and I guess there is always Christmas time shopping, right? I fell right in the middle on this one. I liked it and would definitely recommend it to other readers but there were parts that fell a bit short for me. It's amazing how this seems to live up to the hype. I'm not a dystopia person, but I have to check this one out. It's good that she still feels like a regular teenager despite the foreign society she lives in. Smart to make her relatable. I love dystopian novels...and everyone seems to have good things to say about this book. Hope it lives up to the hype!